Has been called Slievenaroy. Binn Mhairg is the 262nd highest place in Ireland. Hill of Woe woefully overlooked? Binn Mhairg or ‘Peak of Woe’ has a slightly off-line location. Situated as it is at the end of a ridge extending 500 metres north from Binn Chaonaigh, it is just that bit too isolated to attract many walkers traversing the main Maamturks ridge. However it is well worth the detour to take in the exceptional views across a huge corrie to the Binn idir an dà Log massif. 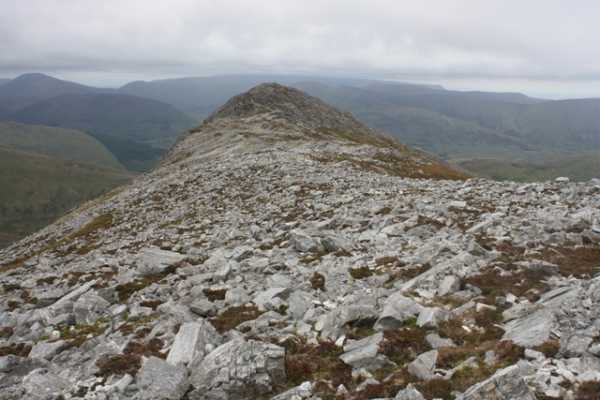 Binn Mhairg can be reached from Maumeen, the col between Binn Mhòr and Binn Chaonaigh. The upper levels of these mountains are pure quartzite, so good footwear is needed to walk on the fields of shattered stone and narrow trails carved out by countless boots. The approach from Maumeen can be started from the car park at L893 495 A. From the car park it is a climb of 150 metres up to the col. Follow the good track up to the col, where there is a Chapel and Holy Well. Turn left to climb 400 metres up to Binn Chaonaigh over initial steep grassy slopes and then shattered rock. Care is needed throughout the walk as some sections are steep. From Binn Chaonaigh head NNE for 500 metres, dropping slightly before climbing to the small summit of Binn Mhairg.